Hand-made logs of road because they demand much hand-worked. 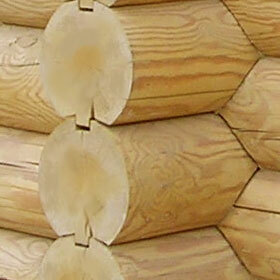 Modern methods of a log machining allow essentially to reduce cost a wall material. Constructed of machine-made logs the house gets absolutely other kind, becomes easier and graceful. Assembly of a house becomes simpler. The wall material have the processing by an antiseptic during manufacture with the purpose of prevention of a log rotting . At assembly of a house the sheeting can be broken in part, in the rainy periods especially . Therefore we recommend to carry out repeated processing by an antiseptic after montage of a wooden house under a roof. At the request of the customer we make additional processing of a machine log by substances reducing combustibility. Diameter of a log up to 200mm. 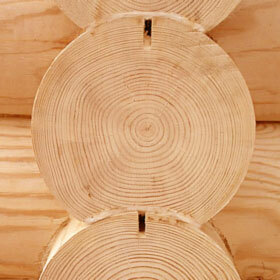 Logs are made in industrial conditions by the Swedish technology Timber Flexi. It is possible to see, that logs densely enter each other, Fig.1. Presence of connection of logs " Thorn - Groove " increases protection against a wind and keeps heat. In addition a thorn and a groove remove the pressure arising at drying of logs and reduce cracks on external surfaces of a log. It is possible to see in Fig.1, that cracks arise mainly inside logs, along a groove and a thorn. Diameter of a log more than 200 mm. The log is made with a classical "lunar" groove. The additional groove is made in the top part of a log for reduction of pressure and cracks. Fig2. Your house, sauna, garden house will look easily and gracefully, if we shall make them for you of machine-made log!